This handbook will provide both overviews of statistical methods in sports and in-depth treatment of critical problems and challenges confronting statistical research in sports. The material in the handbook will be organized by major sport (baseball, football, hockey, basketball, and soccer) followed by a section on other sports and general statistical design and analysis issues that are common to all sports. This handbook has the potential to become the standard reference for obtaining the necessary background to conduct serious statistical analyses for sports applications and to appreciate scholarly work in this expanding area. Jim Albert is Professor of Mathematics and Statistics at Bowling Green State University; Mark E. Glickman is Senior Lecturer on Statistics at Harvard University; Ruud H. Koning is Professor of Sports Economics at the University of Groningen; and Tim Swartz is Professor of Statistics and Actuarial Science at Simon Fraser University. 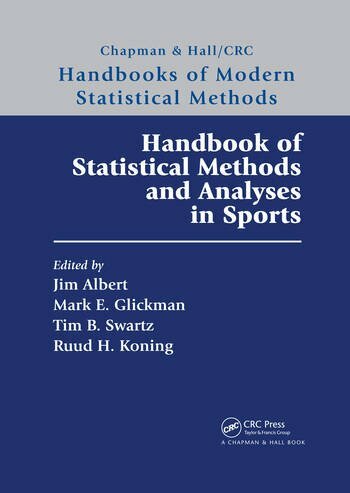 "The Handbook of Statistical Methods and Analysis in Sports is a phenomenal reference text capturing some of the best work of more than 40 statisticians active in the intersection of statistical methodology and sports data. It consists of 24 largely independent chapters each written by different authors, and outlines advances in statistical methodology applied to baseball, American football, basketball, ice hockey, football (soccer), golf, and cricket. The brilliant design of the text’s structure provides readers with a broad survey of the statistics-in-sports research landscape; it could reasonably be implemented in statistics curricula in a variety of formats and at different levels.